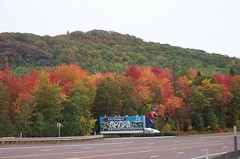 The WOW of Fall, it’s the most colorful time of year at Big Powderhorn. Take your family on a Western UP tour and allow the quilt of color to take your breath away! Hike the many trails or take an afternoon drive down a country road and let your senses hit their ‘peak!’ Right outside your door is the Black River Scenic Byway which will lead to five spectacular waterfalls, Copper Peak and Lake Superior, take it ALL in! You’ll soon realize how easy it is to feel the tranquility and the brilliance of the UP autumn season! Call a BPLA Vacation Planner Today! Fall savings discount is only valid on new reservations made for September 15, 2011 – November 15, 2011. Unit minimums / restrictions apply, cannot be combined with any other discounts / coupons, subject to availability. Four of the top ten “Color Spots” in North America are within a one-hour drive of Big Powderhorn Resort. The 12 mile Black River Scenic Byway is just outside your door. Bring your camera.